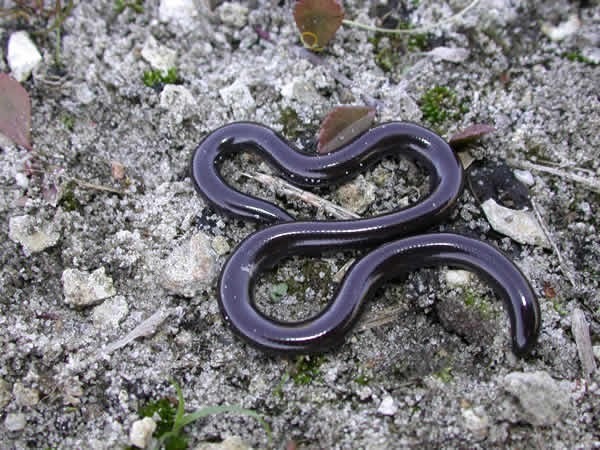 The Brahminy Blind Snake doesn’t have the common characteristics of the average snake living on the territory of the United States, and this is why it is supposed it was brought accidentally from other countries two or three centuries ago. The common American name is the Flower Pot Snake. It has a length of 4-6 inches. The female usually lays the eggs during the late spring, and the babies have two inches at most after hatching. This is why it is considered a reptile of the small snake’s family. A curiosity about this species is that it has no males, and the eggs are created trough cell division once a year. The female lays 2-8 eggs a year. Being a small snake, it feeds with insects with a soft body that can be easily digested. From this point of view, it is really useful for farms and crops, as it is known that the Brahminy Blind Snake eats a huge quantity of insects every day. The snake can be easily confused with a worm because of its small appearance and dark color. It has a dark brown color with light reflexes. However, this is a huge disadvantage, as the Brahminy Blind Snake can be easily observed by birds and other predators. It is also a prey for other snakes, and because of its slow reproducing process, it might become an endangered specie in the future. Some specialists might consider the Brahminy Blind Snake as a part of the earthworm family. However, the earthworms have their body segmented, while this snake is different. This is the most important difference that makes Brahminy a snake, not an earthworm. Moreover, this snake is not able to increase the length of its body, and this is another noticeable difference. Brahminy also has a spur at the top of the tail. The Brahminy Blind Snake is one of the smallest snakes in USA and also one of the smallest snakes in the world. The snake lives in South Asia, but it can be found in different areas of the world, being brought there during the industrial and transportation revolution. Of course, it has an incredible adaptability, as you can find this specie of snake from the northern areas of USA to the tropical areas of Asia. However, we can’t talk about a constant population in USA. The snake was reported in some areas, but we are talking about single exemplars. There are some people interested of breeding this snake in USA, considering its usefulness for agriculture purposes. The snake can be found in urban and rural areas of USA, and it has no preferences about a certain type of habitat. Considering its feeding preferences, the Brahminy Blind Snake can adapt practically everywhere. Just as any other subtropical small snake, the Brahminy Blind Snake lives underground, but also in rotten wood and other warm places. During the winter, the snake will rarely get out of its shelter. This snake also likes the fresh dug soil, so you might find it in your backyard or in your garden.